Just what exactly are MS20253 Pins? The MS20253 family of pins are specifically designed, and fabricated as hinge pins. They are not specified for use in actuation, or as dowel pins, cotter pins, or clevis pins. The MS20253 Hinge Pin was designed specifically to provide for an exacting “backbone” in Mil-Spec Hinge assemblies. The MS20253 is fully-defined on its spec sheet here, and is summarized as follows; MS20253 Hinge Pins are straight, cylindrical Stainless Steel Pins available in either a Passivated finish (per QQ-P-35) or a Cadmium Plate finish (per QQ-P-416). Additionally, MS20253 Hinge Pins of either finish are available with a Solid Film Lubricant (per MIL-L-46010) when your application calls for a little less friction. Passivated MS20253 Pins appear bright silver in color, Cad Plated MS20253 Pins appear gold, and MS20253 Pins with Solid Film Lubricant appear dark grey. MS20253 Hinge Pins are fabricated with approximate chamfers on both ends to aid assembly with mating hinge halves. MS20253 Hinge Pins are available in 5 distinct diameters; 0.062” (1.57mm), 0.089” (2.26 mm), 0.117” (2.97mm), 0.179” (4.55mm), and 0.129” (3.28mm). 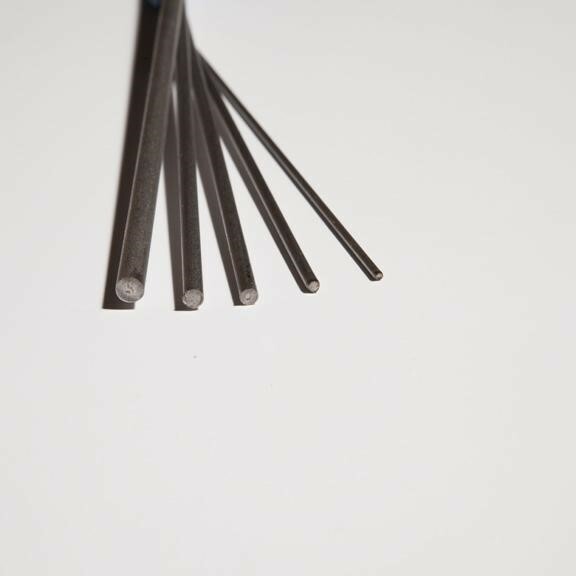 The MS20253 Pins are stocked in lengths of 72” (1,829mm), and are available from LaDeau at any length, from 0.5” (12.7mm) to 144” (3,658mm), and even longer in some cases. The MS20253 Hinge Pin is directly referenced from both the MS20257 Hinge and MS20001 Hinge Spec Sheets, as the only valid Pin for either assemblies. Stainless Steel MS20257 Hinges utilize Passivated MS20253 Hinge Pins, while Aluminum MS20257 Hinges and all MS20001 Hinges require Cad-Plated MS20253 Hinge Pins. Since the MS20253 Hinge Pin is frequently called for in technical specifications of the aircraft or military industry, it is often subject to strict DFAR Compliance, or other Country of Origin requirements. As such, LaDeau Manufacturing manufactures the MS20253 Hinge Pin from raw materials melted in the United States, and never uses materials from any other origin. LaDeau Manufacturing has been perfecting the fabrication of the MS20253 Hinge Pin for over 70 years, and so we welcome any additional questions you may have about this integral component. You can reach our friendly staff at 818-240-3990 or via email at info@ladeau.com.